Registration is now open for the 24th Annual Charity Golf Tournament taking place on Thursday September 15, 2016 at Sleepy Hollow Country Club in Stouffville. Special thanks to 105.9 The Region for their generous media support of Participation House, Markham Charity Golf Tournament. We are off and running with the preparations toward a most successful Golf Tournament. 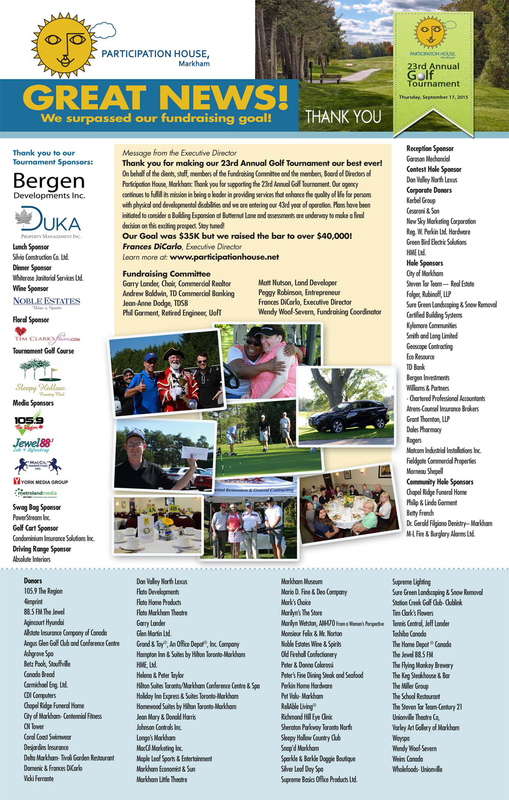 The date is set on Thursday, September 18, 2014 at Sleepy Hollow Country Club. Please visit our Golf Tournament website for all of the details! Check out the great photo gallery from our 21st Annual Golf Tournament. Thank you to all of our golfers, guests, sponsors, donors, volunteers and staff for helping to make this event a huge success! Visit our Golf Tournament page for all the details of our Golf Tournament held on Thursday September 19, 2013 in support of our Physiotherapy Program.